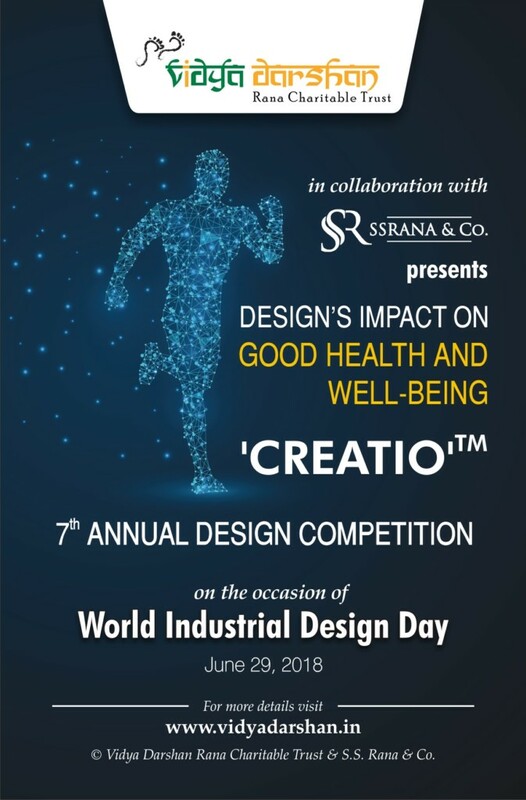 On the occasion of World Industrial Design Day – June 29, 2018, Vidya Darshan Rana Charitable Trust in association with S.S. Rana & Co. is organizing ‘CREATIO’TM the 7th Annual Design Competition. Internationally observed on June 29th, World Industrial Design Day aims to promote the profession of industrial design by highlighting the ways in which it contributes to the improvement of economic, social, cultural and environmental quality of life throughout the world. ‘CREATIO’TM – The Design Competition ‘CREATIO’TM invites young creators to create new designs and aims to educate people, raise awareness and provides a platform for all to exhibit their talent. Win recognition, acclaim and acknowledgement. Register your design with the “Indian Patent Office” and become proud owner of an Intellectual Property Asset. We shall assist you in filing and prosecuting the design application on a pro–bono basis. This does not apply to the design sent for this competition. This year the International Council of Societies of Industrial Design (ICSID) has chosen the theme “Design’s impact on good health and well-being”, the theme talks about a complex set of factors and conditions that determine the level of quality of life of every human being. This year the intellectual creators would create some innovative industrial design keeping in mind the socio-economic factors and genetic factors that contribute towards good health and well-being of a person. Following the same path ‘CREATIO’TM invites you to come up with any industrial designs which may relate to any field including Textile & fashion, Furniture, Household goods (including kitchen appliances), Home décor (interiors and accessories), Pottery, Jewellery, Games, toys & sports or any other new design which would help to redefine the industry according to the theme. The design submitted should be original work of the participant and shall not infringethe Intellectual Property Rights of any third party. Entries previously sent and awarded in other Design competitions shall not beconsidered eligible and will face immediate disqualification. A participant can submit more than one design; however separate entry has to be madefor each design. Joint submission (only up to 2 designers) shall be acceptable. Design can pertain to any 2-dimensional or 3-dimensional article. Participants are encouraged to submit different “views” of the design to give the Judgesa fair idea of their creation. The design should be uploaded in either pdf or jpeg format, the image of the designthus submitted should not exceed 10 MB size. In case of a working model, the participant may upload the photographs of the same. As the registration formalities are completed, a unique “Registration Number” will bepromptly provided to all the participants. The Registration Number shall be used for all future correspondence. Separate entry isrequired to be made for each design. The last day to submit the entry is June 24, 2018. Entries received after the deadlinewill not be eligible for the competition. Responsibility to comply with the guidelines and other conditions fully lies with theparticipants and neither Vidya Darshan Rana Charitable Trust nor S.S. Rana & Co. shall be held liable for any dispute raised by the third party. All entries are to be uploaded at the portal only. Nophysical form shall be accepted. Qualified design experts and judges will then select the best design following which thewinners will be announced in IP Connect, S.S. Rana & Co.’s weekly newsletter on June 30, 2018. All entries shall be judged by a panel of intellectual property experts and design Professionals and the winners shall be selected by a consensus of the Judges. The Judges’ decision shall be final and binding on all participants. The competition intends to provide a platform to the students to share their creativity in the arena of industrial designs. The organizers of the competition reserve all rights to change the date of announcements of the results and/or the date of announcements and publication of the results. The organizers also reserve the rights to withdraw any or both categories of awards if the entries thus received do not meet the aforesaid criteria. The organizers also reserve all the rights for exhibiting the selected designs, due credit in this regard shall be given to the designer(s). In case of a joint entry the prize money mentioned above is to be divided among the designers, no separate recognition except certificate is to be given to the joint designers. Notwithstanding anything, in any circumstances the aforesaid rules or any statement cannot be challenged, the organizer reserves all the rights to change or modify the rules. The winner, selected by the Judges, will be awarded with a “Magical Creator of theYear” award along with a cash prize of INR 7000, a certificate and assistance on a pro bono basis for getting his/her design registered with the Patent Office. In case of a tie, the prize money would be equally distributed among the winners. This is our small endeavor to raise IP awareness in India and help the grassroot innovators,artisans, creators and designers to realize their true potential by providing a national platform to them. Vidya Darshan Rana Charitable Trust may conduct an exhibition of all the selected, finalists and winner’s entries. For further information feel free to call us at +91-11-4012 3000 write to us at info@vidyadarshan.in. Follow this link to submit your entries.